An original, new Cornish Pasty crisp has just hit the shelves and is already causing quite a buzz. 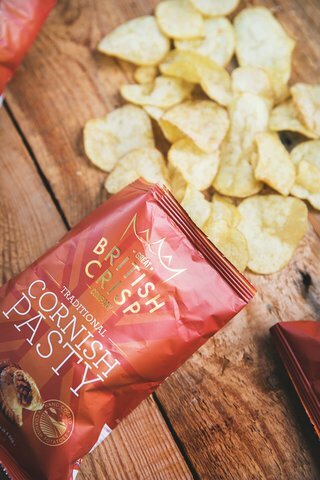 Crafted by the Great British Crisp Company, the irresistible flavour pays homage to Cornwall's well known popular snack. Working in collaboration with Warrens Bakery, the oldest Cornish pasty maker in the world, this must try addition is bursting with the flavours of rich steak, vegetables and of course, potato. The new variety is available in two sizes 40g, RRP 75p and 150g, RRP £2.19. For further details visit www.greatbritishcrispcompany.co.uk. These delicious Cornish Pasty crisps join the 'Meal in One Bite' range introduced by the Great British Crisp Company earlier this year. Other flavours include traditional British favourites such as 'Fish and Chips', 'Chicken Tikka Masala', 'Classic English Breakfast' and 'Roast Beef & Horseradish' as well as more traditional flavours such as 'West Country Cheddar and Chive' and 'Cornish Sea Salt™ & Cider Vinegar'. The Great British Crisp Company has already excelled themselves in international export with customers as far reaching as China, Singapore, UAE, Bahrain, Kuwait, Scandinavia, the Philippines, Japan and Hong Kong and new customers in Germany and France have been established to start in the New Year. Key to their success is their use of the finest local ingredients from mineral rich Cornish Sea Salt™, to Cornish potatoes. The crisps are hand cooked in small batches using the finest sunflower oil and potatoes before being seasoned using Great British Crisp Company's creative seasonings. All of their crisps are also free from MSG, hydrogenated fat, artificial colouring and flavours and are gluten-free. Formerly The Cornish Crisp Company, Great British Crisp Company since last year has been refurbished, upgraded and modernised. The past year has also seen the introduction of ground-breaking varieties and rebranding with a fresh and contemporary new look. Visit www.greatbritishcrispcompany.co.uk for further information.